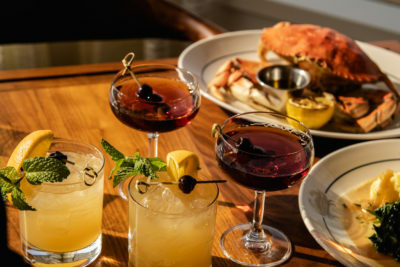 Since 1935, The Grotto, a classic San Francisco seafood restaurant, has been serving amazing dishes, offering friendly service, and boasting incredible harbor views. San Francisco draws in visitors from around the world giving The Grotto an international platform. Before Fisherman’s Wharf even existed as a destination, The Grotto was the first sit down restaurant established in the neighborhood. Today, it features a newly renovated restaurant, oyster bar, and lounge. Reservations are available upon request for guests’ convenience. You are invited to experience delicious, fresh seafood dishes in a lively, historic setting. We look forward to serving you. The Grotto is proud partners with the Monterey Bay Aquarium’s Seafood Watch program. The organization’s mission is to set the environmental sustainability bar for the seafood industry. We are dedicated to implementing this mission through the decisions we make in our operations and kitchens. From its historic place at Fisherman’s Wharf to the countless awards it’s received, there is always something happening at The Grotto. Stay up to date on our latest news, features, and promotions! Our main dining room boasts incredible views of the iconic Gold Gate Bridge and the harbor. This view makes The Grotto a perfect location for romantic dinners, celebratory occasions, and memorable trip destinations. The Grotto’s bar features a great variety of locally batched spirits, beers, and wines. We believe that delicious seafood should be accompanied by the perfect drink. The Grotto features a one-of-a-kind mahogany bar that was custom built for the restaurant in 1935. The bar is accompanied by a restored tiled fireplace that gives the space an early 20th-century lounge feel. It’s the perfect setting for sipping cocktails, enjoying chilled oysters, and listening to beautiful music by our pianist. Our team is comprised of culinary professionals and experts who strive to create memorable dining experiences for each guest. If you are interested in joining our dynamic team, please get in touch.